Description - Our Ribtrax tiles carry the most colors and are one of the largest vented garage tiles we carry. This popular vented tile comes in 19 different colors allowing you to create any type of design your heart desires. 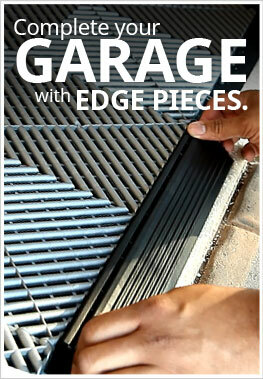 Larger than most hard plastic tiles at 15.75” x 15.75”, installation of your new garage floor will be a breeze. Since these tiles are vented, water and any other liquids will easily flow through the floor ensuring a slip-resistant and dry flooring surface. 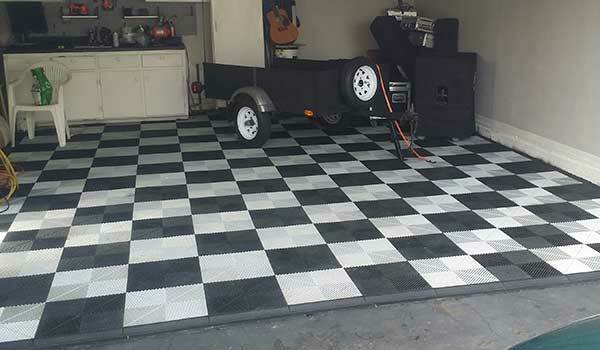 This interlocking garage tile has been designed to be UV stable in direct sunlight and is resistant to most chemicals and oils; which means your floor will look like new for years to come. Ribtrax tiles are also very strong, with a psi rating of 5120 and feature an industry leading 15-year warranty. Weight – ~1.6 Lbs. per tile. 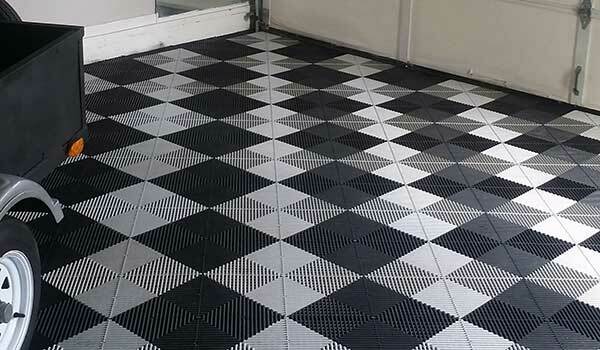 Recommended Uses – Ribtrax garage tiles are truly built to be a multi-use durable floor tile. These tiles are most commonly used as garage tiles however they have also been used successfully as a flooring option in airport hangars, boating docks, car dealerships, event floors, gyms, offices, patios and decks, around pools, and as shop flooring. Our Strongest Garage Tile - 3/4" Thick! Easy to maintain and slip resistant. Large 15.75" x 15.75" vented garage tile. In the instructions it says to leave a 1/4" gap from the wall to allow for thermal expansion. What if you put heavy cabinets, workbenches along the wall - would this prevent the tiles from expanding when needed? If so, would I be better off leaving the cabinets/workbenches/etc in place and cutting the tiles to fit around them with the 1/4" gap? Placing heavy workbenches or cabinets on the flooring will not keep the flooring from expanding and contracting properly. The expansion gap is really for areas where the heating and cooling of the floor would be uniform. Since in most garages this is not the case, an expansion gap will not fix any expansion and contraction issues. Since our Ribtrax Tiles are vented, you don't get some of the issues that you see with our solid tiles. So we would recommend installing your flooring as per the instructions and feel free to place any equipment you like on our flooring. Are the EcoTrax compatible with the RibTrax? The EcoTrax will interlock with the Ribtrax Tiles. Since the pattern on top is a little different, there will be a slight difference in height. Can this type of flooring be used as a pad for a motorcycle? If so, what can I use to anchor the pad to keep the flooring from shifting? The weight of the tiles and the edging will keep the pad in place. As long as you don't peel out or stop super hard and fast on the parking pad, you shouldn't have any issues parking your car on our Vented XL Grid-Loc Tiles. Have a 24ft X 20ft carport, roof with no walls which means it is exposed to blowing dirt, blowing rain and rain water runoff from the roof. Like the idea of the vented tiles because of the inability to seal the edges of 'solid' tiles to keep runoff water from seeping under and just sitting there. Would the male/female edging actually seal the edges?? Would need edging for 3 sides - ballpark pricing? 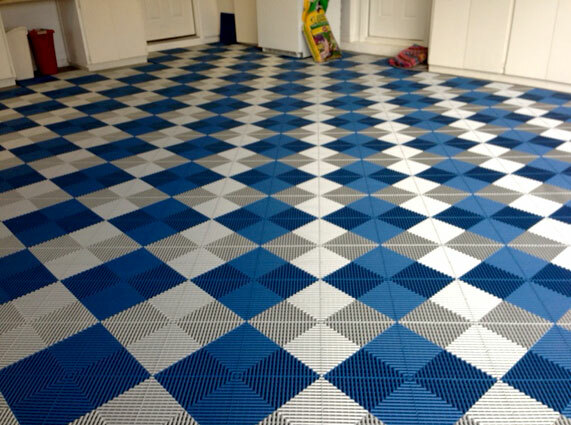 The edging for our Vented XL Grid-Loc Tiles does not seal the floor. Water and other liquids would still flow under the tile and the edging. Is the top surface of the tile smooth or is it grooved. I want to use it in a small office room and want to ensure that the chairs could roll on it easily. Thanks. Our Ribtrax tiles are a vented tile but allow chairs to be rolled over them. We were looking for something to cover the garage floor which would be full of boxes after the moving van arrived. In my search, I discovered this wonderful tile which would be exactly perfect since Florida tends to be humid and promote mold and mildew. This tile is 3/4 of an inch off the floor with an open venting system. So I ordered the two colors I love and when they arrived my husband and I started snapping them together. It was amazingly simple and fast. After a few hours we had a classy looking garage. We decided to do the classic checkerboard pattern, since the boxes would cover the tiles at this point. (I'm including a photo.) We are extremely happy with our "new looking" garage. And the best thing is should we ever decide to move again, or even simply want a different pattern, these tiles can easily be stacked in a box and carried to a new home to be used again! I did a lot of research and ordered samples before deciding to go with the Swisstrax Ribtrax floor tile. I like that they are larger tiles (15.75 x 15.75 vs 12 x 12)and they are also thicker tiles (3/4 inch vs 1/2 inch). I went with the Pearl Silver which looks GREAT! They cost a little more but are definitely worth it. I waited until they had 30% sale so got a great price with free shipping. If you buy these direct from Swisstrax you will pay a couple of hundred dollars for shipping so Garage Flooring Inc. is a great place to purchase them. The customer service is excellent. I completed installation myself in about 5 hours. They are very easy to install. I have had these installed for about 2 months and have nothing negative to say at this point. I have a 1.5 inch lip coming into my garage which did cause a problem with tiles moving for my neighbor which we solved by purchasing a metal ramp directly from Swisstrax. It works great and I highly recommend. I am a do-it-yourself guy so also build custom cabinets to finish off my dream garage.